Happy Spring you guys! I am beyond thrilled to share this post with you. In fact, I’m so thrilled that I made this Fig + Bourbon Glazed Ham just this morning and realized I needed to get it to you STAT. So here I am, late afternoon typing away so it can make it onto your Easter menus. Here’s the deal. 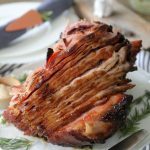 I love every recipe that I post to this blog. Like a lot. They wouldn’t make it on to here if I didn’t. But some recipes… I really love a lot. And this is one of them. 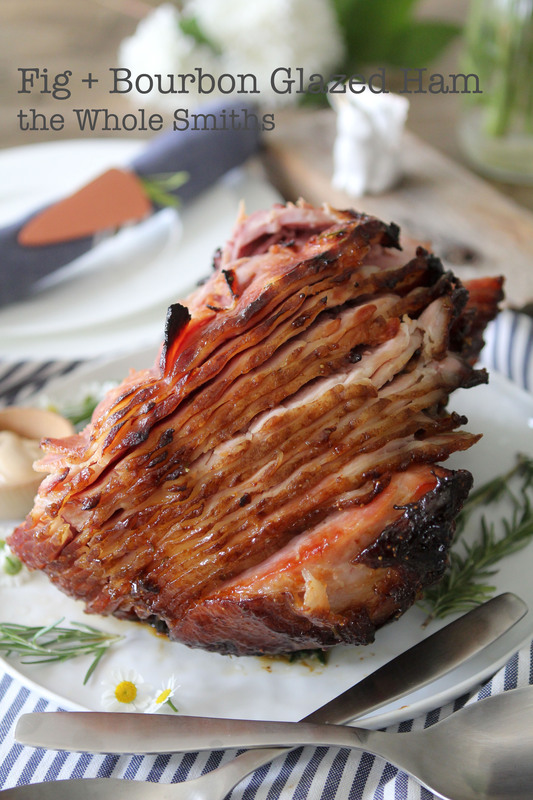 And I’m really hoping this hot ham makes it onto your Easter breakfast, brunch or dinner table. It feels really special and you and your family will love it. Let’s get back to this “hot ham” bit, shall we? Not too long ago, Farmer John approached me and asked if I would be interested in participating in their “#hothamsofinsta” campaign showcasing Farmer John ham. Are you kidding me? How clever and adorable is that? I mean, sign me up. This campaign was right up my alley and I truly love a creative and fun project. If you aren’t following me on Instagram yet, you definitely should as it’s a lot of fun. Or maybe I just have fun creating content for it? Either way, there’s some major fun going on over there. Hit me up HERE to follow the fun. I’ve also did a quick tutorial on Instagram stories of just how to make this hot ham. Now on to the recipe. A few years back I made a fig crostini that I just adored. So much so that I can still taste the flavors in my mouth if I close my eyes and get quiet for a moment. (Is that super weird? Probably, but I’ll just go with it.) Anyways, the flavor combination of the fig, bourbon and rosemary really stuck with me and I’ve been waiting for another opportunity to put it to good use. Well I found it! It makes the most perfect ham glaze ever. After I had finished cooking the ham and began plating it and the tender meat began to fall right off of the bone. Lucky for me, unlucky for the picture I was about to take. I digress, but I couldn’t stop eating little pieces as I took these photos so I’m gonna just stick with lucky for me. 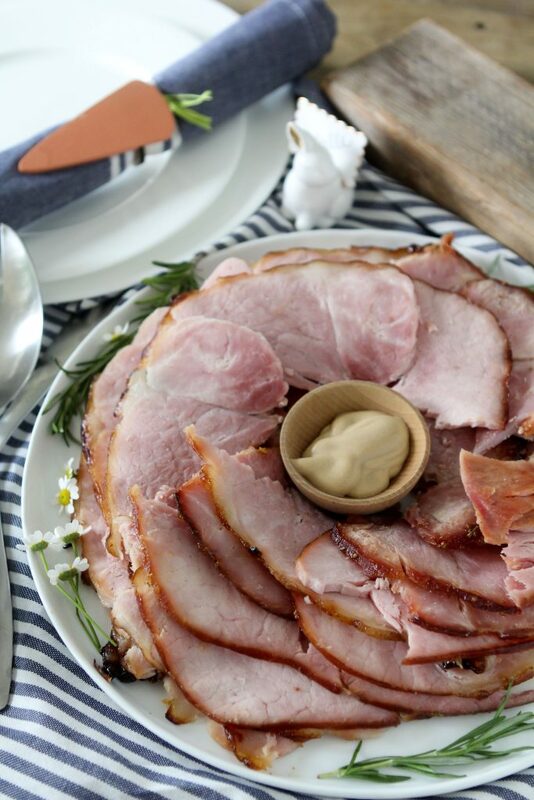 That’s pretty much what you’re going to be doing as you get this delicious ham prepare for your Easter table. I promise. Can we chat about hosting holidays, parties and events for one second though? 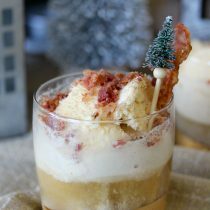 First off, I adore putting on a good dinner party, holiday dinner or cocktail night. I really do loving hosting. There’s something that feels good to the soul about providing good food and a good time to my friends and family. I’ve always loved it. Even when it was back in my 20’s and we hosted a Cinco de Mayo party catered by Taco Bell. (Seriously, we ordered 100 tacos and everyone was happy as can be. I think after a few margaritas people are liable to eat anything.) And while my hosting has evolved greatly from those Taco Bell days, the fact that I’m still prepping things after people start arriving makes me crazy. So when I realized just how easy this Farmer John ham and glaze were to prepare, I was thrilled. I could easily have it prepped, cooked and ready to go long before my first guest arrives. Leaving me plenty of time to dilly dally with deviled eggs. Long story short, if you want to impress your friends and family but don’t want to be running cooking for hours leading up to Easter this hot ham is for you! 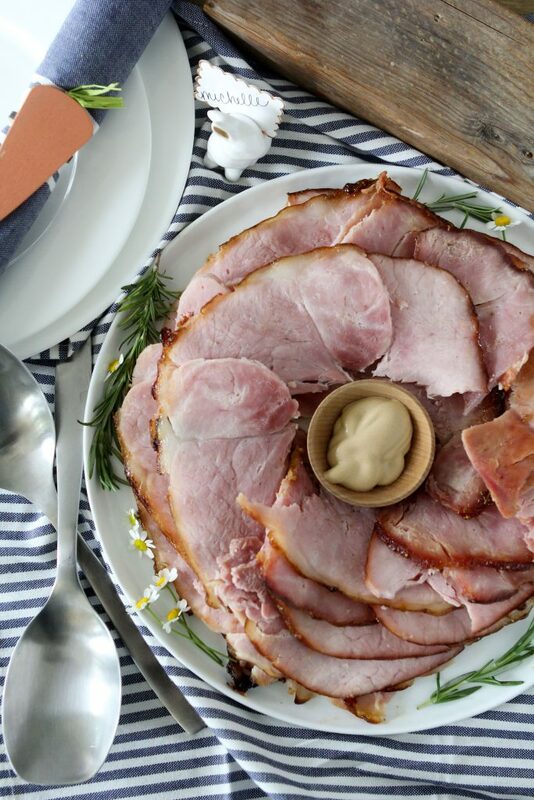 An easy-t0-make Easter ham that the entire family will love! Gluten and grain free. Heat a large saucepan over medium heat. Add fig preserves, orange juice, bourbon, chopped rosemary, chili powder and salt to the saucepan. Continually stir and cook ingredients as they begin to simmer and reduce down, you'll want to do this for about 10 minutes. 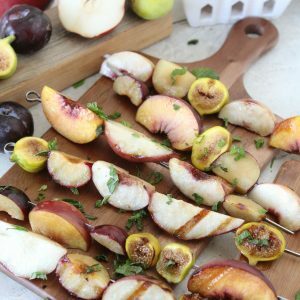 Once your fig glaze has receded down and thickened, gently spread it over ham making sure to get it into every nook and cranny. Place ham on a roasting pan and bake ham for 15 minutes for every pound, in this case 2 hours. When ham is done cooking, remove it from the oven and let cool prior to serving.